How to clean desert boots and chukka boots - "Pisamierdas"-"Botas Safaris"-"Carapijos"
How to clean your Desert Boots? The first thing to consider is that the material is leather and not textil, as is sometimes confused. We are talking about a natural material and has had a careful processing before reaching become boots. How to clean and care for the split leather? I'll give you some advice, some of them are typical lifetime for this type of leather and others are tips over the years online sales that has been collected from customers. If only we want to remove dust, dirt and surface spots that may have our desert boots, the best is with a wire brush as you have in the image. After a general brushing, finishing brushtrokes looking plush natural fall of the split. As if you were combing boots. That is more than enough for them to stay clean and perfect for use. If we have a stain of any grease, oil or similar type product, there are several ways. The best by customers who have several of our Chukka boots is quickly put on the spot a handful of salt and thus leave one day. I haven't tried but ti's said that the stain disappears. After brushing only a little to remove the fence and ready to leave. If the stain is any liquid that has dried up because you couldn't act inmediately, don't worry. There are several ways to leave again new. The first is that once brushed celan to remove dust with a little ammonia mixed with water. Not to soak much. And very important to dry in the shade. Once dry brush to relet loose the plush of the split leather. Another way to remove some stains and resected or leave something Gumby is to use a piece of rubber and act as if an eraser. If you can't try a piece of bread. Another way is to put the area of the stain on a steam source. For example heat water in a kettle and put the stain a few inches above the steam outlet. Once is hot and wet the stain or whatever is embedded will be very easy to remove. 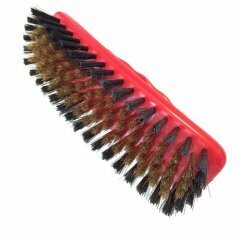 I always advise you before doing anything, you try to brush with metal bristles brushing. You have to brush without fear, scratching either the split leather to pull dirty hair and create "new hair" again. If you do it good you will always have your desert boots as new ones!